In a quiet residential area, in a beautiful villa of 1969 style renovated in 2017. 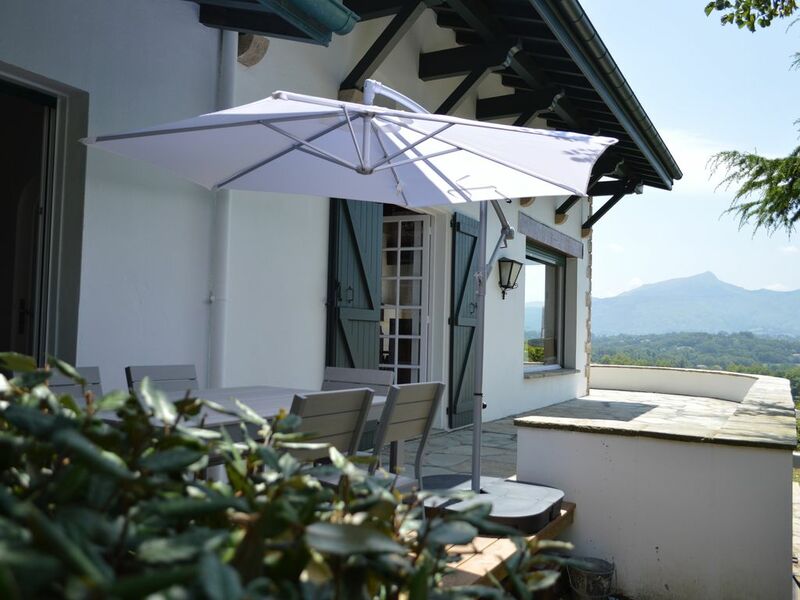 It offers a terrace facing south and west of more than 70 m2, and a garden of about 100 m2. The rent therefore corresponds to 240 m2 inside plus 70m2 of terrace representing the whole surface of the villa except a studio on the floor (independent entrance) and except the basement not included. The main room is a lounge / dining room facing south and overlooking the terrace; This room having an area of ​​80 m2, and a small mezzanine of 6m2. The sleeping area (4 bedrooms + 3 bathrooms and shower + 3 toilets) is located in the eastern part of the house. It was built on the top of a hill 10 minutes walk from the beach of Socoa and shops and 15 minutes walk from Saint-Jean de Luz. We spent about two weeks in this newly-renovated home. All 4 bedrooms are a good size, the kitchen is brand new, the view is magnificent and we had an all-around good time. There are small trees with apples, pears, and figs in the front yard, free for the taking in the right season. Half of the upper floor of the home is a second apartment, but we didn't have any issues with noise, though I imagine it might be with the wrong combination of guests in the two apartments. The owners (who are super-nice) have a dental shop in the basement. They were extremely responsive and wanted to make sure they weren't disturbing us at all. This place was a great deal. Our deposit was promptly returned in full, no issues to report. Très belle maison basque, confortable et très bien exposée. Avons passé un excellent séjour. Das Haus ist absolut ausgefallen, kaum zu glauben und einmalig, dass man so etwas als Ferienhaus mieten kann. Sehr ruhige und angenehme Umgebung, die Lage ideal für Unternehmungen: Berge, Dörfer, Städte, Strand.